It’s time for another Stitch Fix review! 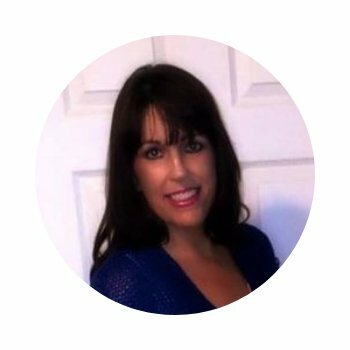 If you do not know what Stitch Fix is, check out this post. I requested a full outfit. I wish I had requested full outfits when I started getting subscription boxes. I ended up with several pieces that do not go with anything. I request pieces that go together now. That is the whole reason I started receiving clothing subscriptions. I needed a new wardrobe that did not consist of all t-shirts and yoga pants. Seriously. I still wear t-shirts and yoga pants. Not everyday. I hope you get some inspiration out of this review. This skirt was really cute. I loved that it was reversible. 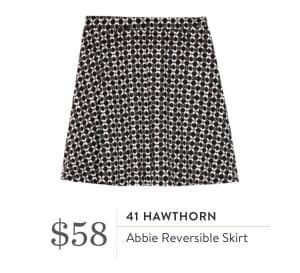 It’s like getting two skirts for the price of one! It fit great and looked nice. There was just one thing. I do not wear skirts. Ever. It has been way too cold here in Tennessee to be wearing short skirts. I wanted to keep it. I had to do a reality check. If I know I won’t wear something there is no need for me to buy it. It will end up in the back of my closet. I thought about keeping it and wearing it this summer. Who was I kidding? I don’t wear skirts. Returned. I usually do not like stripes or colorblocked tops. The colors caught my eye. Purple is my favorite color. This top fit me very well. It was comfortable. It was way too thin. I took some pictures of it. You could see my backdrop through both layers. I have a couple of tops this thin. They snag really easy. I can not justify the price of this. It is just too thin to pay $58 for it. Returned. I have been collecting fashion jewelry lately. This could not have come at a better time. I like to wear long necklaces with plain tops. I’m kind of plain. I need all of the help I can get. 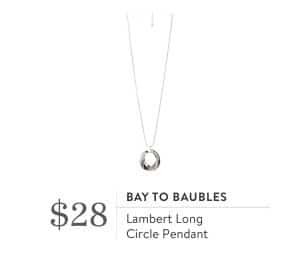 Bay to Baubles has a lot of nice quality jewelry. This necklace was no exception. It doesn’t look cheap like it came out of a gumball machine. Are gumball machines still around? I have a few pieces from Bay to Baubles. I have not been disappointed yet. I kept it and I wear it often. 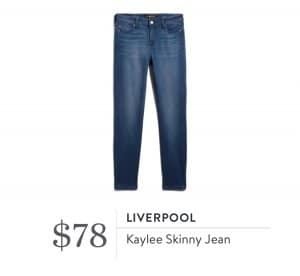 Liverpool is one of my favorite brands of jeans. My top 3 favorite jeans are Liverpool, Kut From The Kloth and Vigoss. Skinny jeans are my favorite style of jeans. These fit perfectly. They look nice too. I did not keep them. I have several pairs of jeans. I do not need them. I’m looking for pretty more feminine outfits. I have a ton of casual tops and jeans. Returned. I love these booties! I can channel my inner Prince with these booties! Lol! Loud colored footwear normally aren’t my thing. I love purple. These spoke to me. Also, the booties looked great with the skirt and the jeans that I got in this Fix. There was a problem. They were not comfortable at all. The left bootie dug into my heel. These booties feel like they were made from cardboard. The quality just was not there. 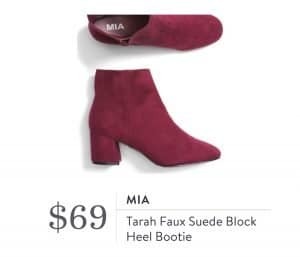 I can not justify the price compared to the quality of the booties. If these they had been made of real leather or suede, I would have bought them in a heartbeat. Sadly, I returned them. That’s it! That is what I got in this Fix. I liked everything in this box. It is a shame that the quality of certain pieces were not great. The paper-thin tops have been in style for a long time. I’m not a fan of them at all. I want my sweaters to keep me warm. I am funny that way. I have bought the majority of my Stitch Fix boxes in the last year. I love when everything in the box works for me. You get a 25% discount for buying the whole box. Your styling fee goes towards the final cost of the box. 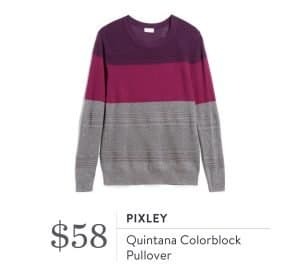 Don’t forget, if you want to learn more about how Stitch Fix works, you can checkout this post. Click here to have your styling fee waived on your first Stitch Fix box!